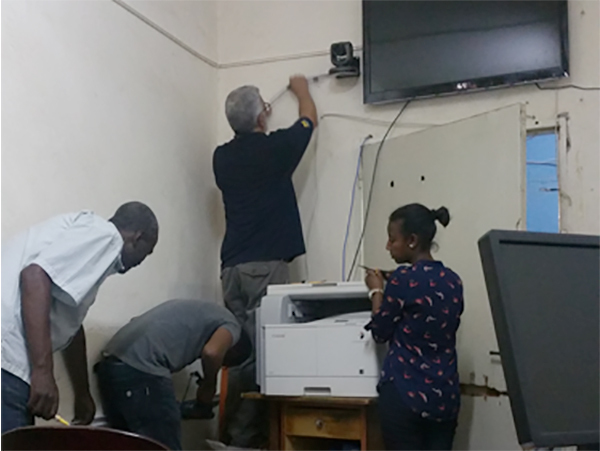 Bob Riddle configures videoconferencing infrastructure with colleagues in Addis Ababa, Ethiopia. More than 150 U-M faculty representing 30 departments are engaged in global health with collaborations spread across more than 70 countries. Michigan Medicine has agreements with 31 partner schools and institutions abroad through its Office of Global REACH. The first project undertaken by Michigan Medicine in Ethiopia started in 2011 and focused on launching a competency-based, OB-GYN residency program—the first of its kind at St. Paul’s Millennium Medical College. It was spearheaded by Prof. Senait Fisseha, U-M adjunct professor of obstetrics and gynecology, who was raised in Ethiopia. The OB-GYN residency program included collaboration with Open Michigan to produce open educational resources, digital assets that opened the door to technology collaborations across the institution. Setting up videoconferencing was just a day in the life for Riddle. As part of his HITS role, he has been supporting the IT infrastructure of St. Paul’s from Ann Arbor since 2013. He’s also been on the ground in Addis Ababa, Ethiopia, since 2015 through the Center for International Reproductive Health Training, a group that trains health professionals in low-income countries in life-saving reproductive health services and comprehensive family planning. 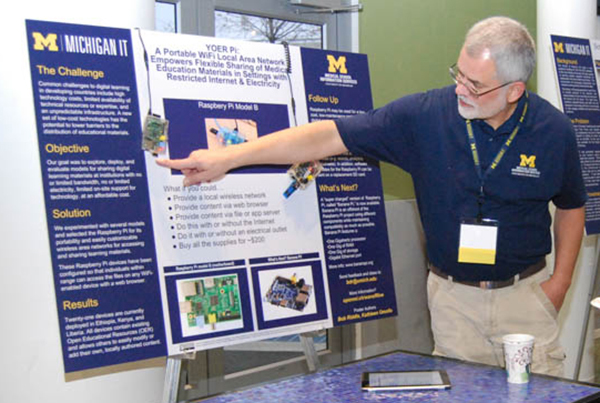 Bob Riddle presents at the Michigan IT Symposium in 2014 (download PDF poster). The topic: how to share digital learning materials at institutions with no or limited bandwidth, electricity, and IT support. When it came to making videoconferencing work in Ethiopia, Bob Riddle and his collaborators were met with many challenges. Faced with limited bandwidth and too few IT staff, they needed a turnkey solution. BlueJeans is the preferred videoconferencing tool at U-M. Prior to that, Riddle used a competing, software-based service that also offers videoconferencing and screen sharing. But it wasn’t quite right. “We found that the prior solution was not as accessible, and it didn’t behave nearly as well as BlueJeans,” said Riddle. They also tried a hardware solution built on technology that does not perform well in limited-bandwidth environments. BlueJeans service adjusts dynamically to the amount of bandwidth available, keeping the connection stable for a seamless user experience. Another challenge: Ethiopia has only a few available public IP addresses—almost everything is connected to a NAT network, which assigns a single public address to devices inside a private network. “The wonderful thing about BlueJeans is you can be on a local network with private IP addresses, and you don’t have to do anything. It just works,” said Riddle.